← Follow The TTC on Facebook! Please click the ticket to view his amazing historical WDW Flickr Stream! 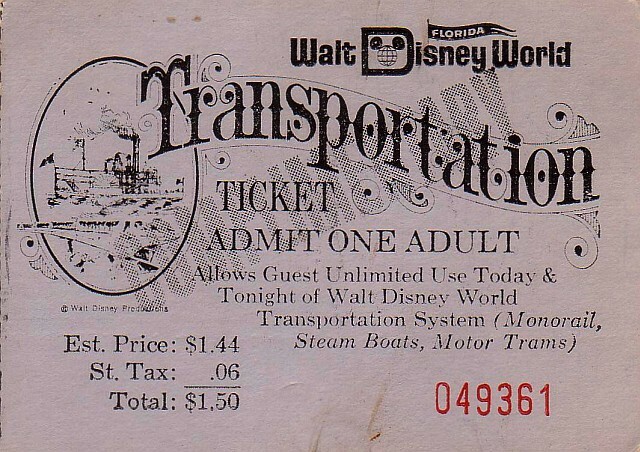 Since this IS the Transportation and Ticket center, it only makes sense to feature this very cool general transportation ticket from the 1970’s. This image comes from an amazing Flickr photostream by a user named UFG8R, who, from what I can tell, was or is an employee at The Magic Kingdom in Florida. I may have to dig a little deeper on this one! In the meantime, enjoy the amazing photos from Disney World, Disneyland, and Disneyana! This entry was posted in Disney World, Disneyland and tagged 1970's, Disneyland, flickr, Magic Kingdom, ticket, Walt Disney Company, Walt Disney World Resort. Bookmark the permalink. He is an original CM from WDW in 1971!